Giveaway sign of an American recipe: the word ‘Jell-O’. In Singapore, we’ve always followed the British usage – ‘jelly’. 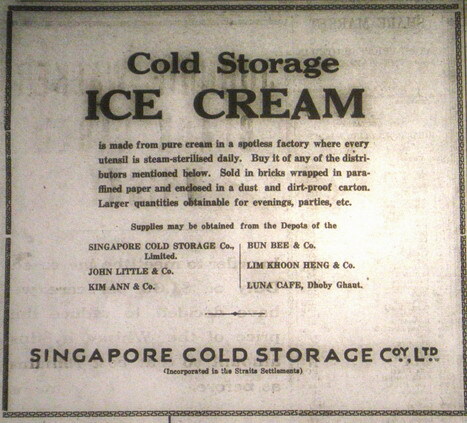 Established in 1903, Cold Storage was the child of the Industrial Revolution and Pax Britannica, when Singapore was the “Clapham Junction of the Eastern Seas”. Together with electricity and refrigeration, it allowed European agents of change – the colonial civil servants, merchants, miners, planters, traders – to acclimatise to living in the tropics. It can thus be said that if there were no Cold Storage the modern history of Singapore would probably be quite different. 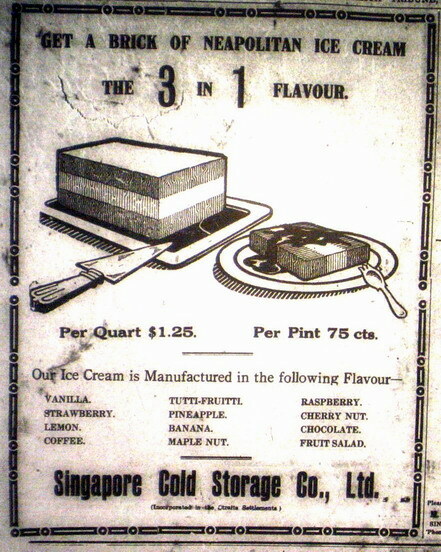 As early as the 1920s, Cold Storage in Singapore was already mass producing ice cream for sale, not just at its own retail outlets, but also at local provision stores and cafes. 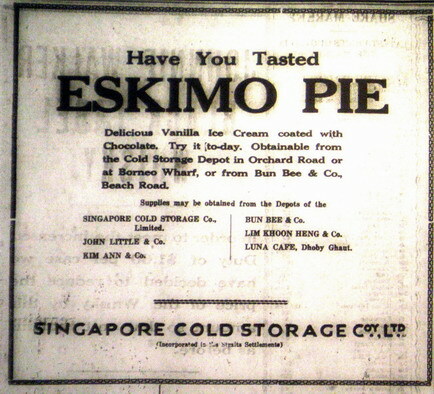 You can see from the following ads (published in the Malaya Tribune newspaper in from 1925 to 1929) the names of places where Cold Storage ice cream was available, as well as the fact that there were many varieties including Eskimo Pie (1925), Neapolitan (1929), and vanilla, strawberry, lemon, coffee, tutti-frutti, pineapple, banana, maple nut, raspberry, cherry nut, chocolate and fruit salad flavours (1929)!! No wonder grandma always had a penchant for cassata ice-cream, layers of different flavoured ice-cream a bit like Neapolitan. As a child in the 1970s, I remember she would always order cassata for dessert (and I hated the bits of fruit inside the layers :P — only peach melba no nuts no cream for me, thank you). I’m sure grandmother has a recipe for ice cream somewhere in her notebook…. and here it is :).